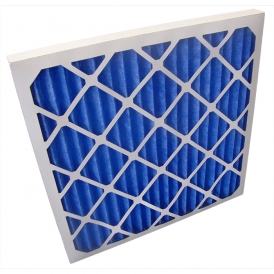 Panel filters consist of pleated synthetic filter media assembled in a galvanized steel/aluminium/wooden frame. Panel filters are often used as pre-filters in air conditioning systems, air treatment cabins, etc. Panel filters may be used both as primary air filters to protect HVAC components (coils, fans, duct work) from unnecessary dust build-up or to protect more expensive secondary air filters from premature dust loading and replacement. These filters are being classified up to G4 (G1-G4) according to EN779:2012.